R.S. 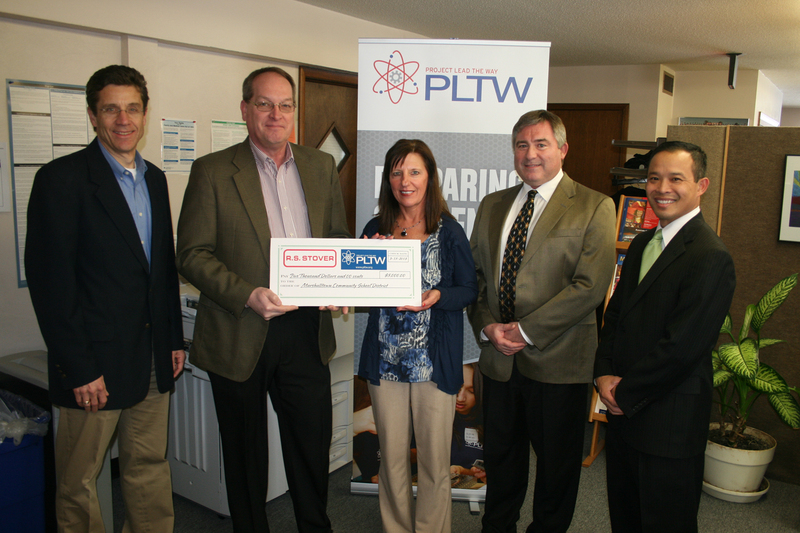 Stover presented the District with a check for $5,000 Monday to support the implementation of Project Lead the Way at Marshalltown High School. Craig Huegel will be the next activities director at Marshalltown High School. The Board reviewed the proposed district budget for 2013-2014 Monday. The Board will vote on adopting the budget at the April 1 meeting. Four Oaks, a non-profit organization that provides a variety of educational and therapeutic services to At-Risk youth, will house three classrooms at Marshalltown Learning Academy beginning next year. Matt Cretsinger, director of special services, told the Board about this partnership, which will include two conduct disorder settings and one therapeutic classroom to serve up to 35 students. Currently the District sends six students out of the district to receive the services Four Oaks can provide, the cost of which is $55,000 to $105,000 per student. Cretsinger noted that with outside placement the District has no say in the education provided and it makes for successful transition back into the regular school setting difficult. Many outside service providers are also closing or changing the scope of their services. Bringing Four Oaks to classrooms within the district means the students will receive the services they need using district curriculum and without the need for extended daily travel. “[Students] have to be set up for success in an environment where they can learn,” Cretsinger said. Four Oaks will provide three Special Education teachers, six youth counselors and one program coordinator. Cretsinger will oversee the program for the district. He says having the classrooms at MLA will also provide more opportunities for district staff to learn about intensive instruction. The contract with Four Oaks is for one year, with the potential to review up to three years. The cost for the first year is $571,000, which will be covered by funds previously needed to enroll and transport students with outside service providers. Superintendent Marvin Wade said having Four Oaks in district allows all students to receive services they need. The Board’s approval of a contract with Four Oaks will allow MCSD to provide specialized services to a select group of high need students within our District. Four Oaks will be housed in the same building as Marshalltown Learning Academy, but will serve a different group of students than MLA. MLA will continue its focus on assisting students who are at-risk of not graduating, while Four Oaks will serve up to 35 students who have conduct disorders or mental health therapeutic needs, and some students who are at-risk of expulsion. The addition of this program is one of many steps taken by MCSD to meet our objective of “providing a safe and supportive environment for learning.” I look forward to future reports about the success of Four Oaks and MLA in meeting this objective. Tonight we met our new Activity Director, Craig Huegel and family: wife, Jen; son, Andrew (6); and daughter, Kerigan (20 months). Craig will be taking the lead of Athletics during a very critical time in our district as the new Roundhouse project starts this summer. He is highly qualified and will have full support of the administration and staff as he begins a new legacy here in Marshalltown. Many thanks to Tim Bell for his long and successful tenure here in Marshalltown with students, athletics, coaching and programs. As with all of the of the retirees, we attempt to replace their skills and abilities, and know that we create challenges and possibilities for new people to come here to our community and educational programs. Welcome to Craig and family! The budget remains a big topic of our work on the Board. As many know, the legislature and Governor’s office have been debating education finding policy for over a year without much success. We are negotiating with our employees, setting budgets for expenses all without knowing if we will get any additional funding from the state. We all agree that education funding needs to be changed, but lack of action and disagreement will not help us get where we need to be anytime soon. We will keep you posted on our plan as this continues. The Board approved increasing the price of high school activity passes for 2013-2014. All season adult activity passes will increase $10 to $90. Senior citizen passes (age 62 and up) will also increase $10 to $50. The cost for employee and employee spouse passes increases $5 to $20. High school student passes will increase $5 to $45. Middle school student passes will increase to $40. Passes for students in grades K-6, as well as district retirees will remain free. Food Service will purchase a new truck from O’Halloran’s in Altoona for $80,570. Two bids were received for the truck. A second bid, from Freightliner, was $1,801 less than O’Halloran’s, but did not meet the specifications needed. The O’Halloran’s truck can also be serviced in Marshalltown. Food service will sell its 1996 truck and use its 2000 truck as a backup. The new truck will be used for delivering breakfast and lunch to the elementary schools from the satellite kitchen at Marshalltown High School. Food Service Director Vickie McVey told the Board the truck delivers about 2,400 lunches daily. The District will purchase a 2004 32-passenger bus from Hoglund Bus Company for $22,000. Transportation Director Don Meyer said the buss needed two thermal window panes replaced, but otherwise was in good working order and had been inspected by the district mechanic. Purchase of the used bus saves $50,000-$60,000. The regular replacement schedule had plans to replace one preschool/special education bus and two 65-passenger buses 2013-2014, but there was a need for two of the smaller 32-passenger uses. Purchasing the used bus now means the district will purchase one 65-passenger bus and an additional preschool/special education bus after July 1, 2013. The District will send to bid two projects – an electrical upgrade at Marshalltown High School and the 1957 wing remodel at Miller Middle School. The electrical upgrade includes underground conduit and conductors, new transformers and new secondary service and electrical panel boards. Work on this project is some of the infrastructure required to begin the Roundhouse renovation. The Miller project includes remodeling 9,258 square feet on two floors, including classrooms and restrooms. The project will also add air conditioning to the 1957 classroom addition. Both projects are part of the District Facilities Plan and will no go to the bidding process. Both are scheduled for completion before the start of the 2013-2014 school year. 405.2 Licensed Employee Qualifications, Recruitment, Selection, mark reviewed. 405.3 Licensed Employee Individual Contracts, modify to say contracts will be not more than one year. 405.4 Licensed Employee Continuing Contracts, mark reviewed. 405.5 Licensed Employee Work Day, mark reviewed. 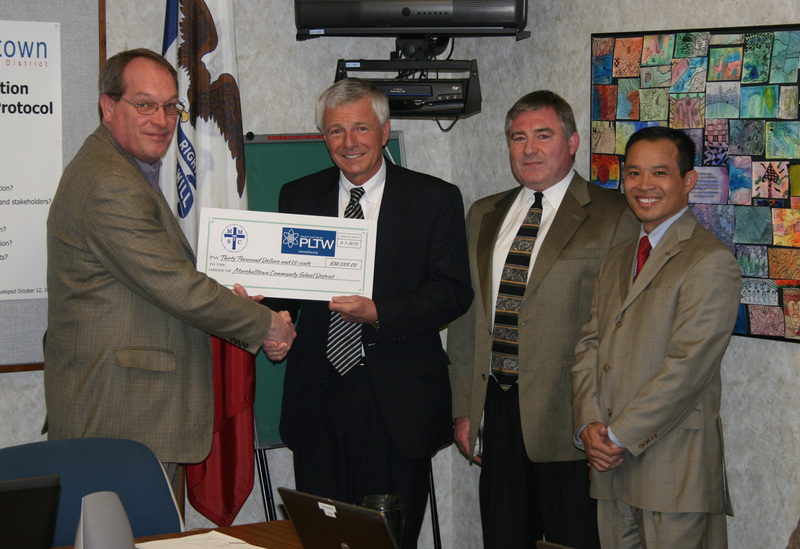 Marshalltown Medical & Surgical Center donated $30,000 toward implementation of Project Lead the Way at Marshalltown High School. Dr. Terry Briggs, chairman of the MMSC Board of Trustees, presented a check to School Board President Sherm Welker Monday night. Funds will go to support the implementation of a Biomedical Sciences program at MHS. The Marshalltown Community School District graduation rate increased nearly 8 percent from 2011 to 2012 according to figures released by the Iowa Department of Education this week. Read the full story on on our news blog, Bobcats Making Headlines. Marshalltown Schools are partnering with the Marshalltown Police Department to review safety policies and train staff in new approaches to school safety. Police Chief Mike Tupper and high school associate principal Deb Holsapple told the Board about training held with district administration Saturday, March 2, on ALICE: Alert Lockdown Inform Counter Evacuate. ALICE is a system to respond to an active shooter threat inside an office, school, etc. Tupper said it’s a system many in law enforcement have believed in for years and it’s now gaining momentum across the country. Instead of the traditional lockdown model, where students and teachers hide in a classroom, ALICE encourages people to evacuate as soon as possible, as well as fight back if necessary by throwing chairs, barricading doors, etc. “These are things I’ve been teaching my kids for 20 years,” Tupper said. He was adamant ALICE was not about teaching children to fight armed gunmen. Instead, it was about teaching staff how to be alert and letting children know it’s okay to escape, even if it means breaking windows. Lisa Koester, director of human resources, said the next step for the district is to review the district safety plans. These were developed in 2000 and are reviewed annually by schools, but the district will now do a more comprehensive review with the MPD. Buildings and Grounds director Rick Simpson also noted some safety upgrades across the district that have already been implemented in recent years, such as security cameras at the high school and more secure entrances at several buildings. 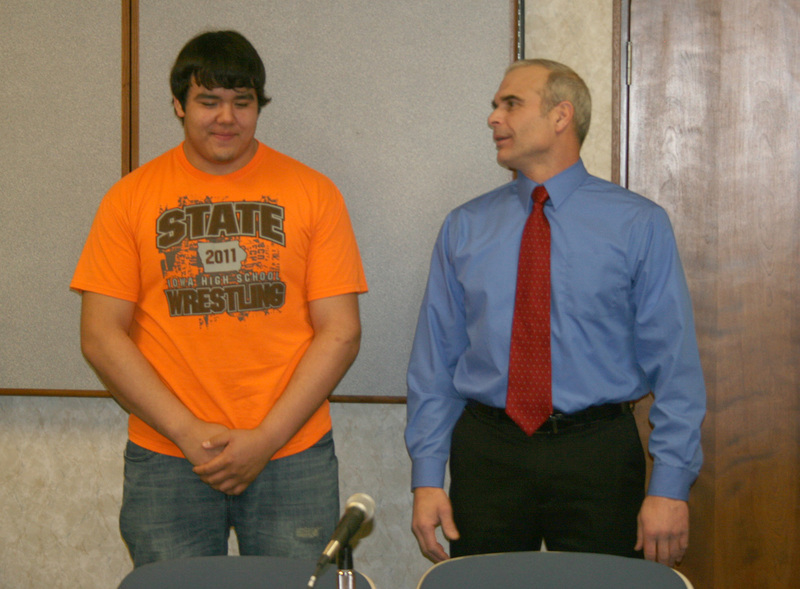 Pedro Gomez, who won the Class 3A 285-pound state wrestling title, was recognized in front of the School Board Monday night, along with his coach, Mike Mann. Gomez plans to attend Ellsworth Community College after graduating from Marshalltown High School, where he will play football and wrestle. Gomez is the first Bobcat to claim a state wrestling title since 2003. Mary Babinat from accounting firm Nolte, Cornman & Johnson presented the 2012 district audit report Monday night. The report showed General Fund revenues increased by $2.67 million in fiscal year 2012 and expenditures increased by $2.55 million. The district solvency ration, which is the unassigned fund balance divided by revenues (minus AEA flow-through funds) increased to 6.94 percent from 6.21 percent in 2011. Board President Sherm Welker noted the Board’s new financial planning committee has set a goal of increasing the solvency ratio to between 8 and 10 percent. The audit had some recommendations for the district, including segregation of duties, making sure all contract changes and fundraisers are approved by the board and the Board president signs all contracts. Tonight the MCSD Board had a safety and security briefing from staff and Chief Tupper on our district buildings and policies. We will continue to train and educate our staff and students on the latest standards being developed on violent intruder procedures. As Chief Tupper stated, we have fire and tornado drills even though the last loss of life for fire in a school happened in 1958, and tornado loss in in 1978. We need to actively train for violent attacks as they are predominately a much larger threat in today’s world. We will continue to coordinate our procedures with local law enforcement so they will know what we are doing should they be called to respond. We are encouraged that our local officials have our security at the paramount of their thoughts and actions. We are very fortunate to live here in Marshalltown and for years have seen living in the Midwest as a “safe haven” free from the tragedies we see in the news. We can no longer depend on the safety of our location and must prepare for the worst case. While the district has always had a plan for such an occurrence, many thoughts and procedures have changed since the latest tragedies have taken place. As always, this is a great place to live and raise our families. We will strive to keep our policies strict to the possibilities, but gentle to those we are privileged to educate and serve. While Federal and State officials publicly grapple over issues such as sequestration and allowable growth, our local Board of Education has diligently focused on developing a budget for the 2013-2014 school year. Instructional Support Levy and Budget Guarantee resolutions have been approved, the budget will be presented as an informational item on March 18, and both Public Hearing and Budget Adoption will occur April 1. As other elected officials struggle for control, it is reassuring to see MCSD board members work closely together to provide the best possible education for the students and families of our community. I encourage everyone to attend the Marshalltown High School Community Open House on Thursday, March 7, from 5:00-8:00 pm. The fourth annual MHS Community Open House is a project of MHS Parent Networking to showcase our great students and school to community members – especially those who may have limited contact with Marshalltown High School. 703.4/E – Fiscal Management – Performance Measures, adopted as amended. 403.1 – Employee Physical Examinations, add paragraph on blood-borne pathogens, waive second reading. 403.4 – Hazardous Chemical Right to Know, add “or designee” after superintendent, waive second reading. 403.5 – Harassment – Employees, add “or designee” after superintendent, waive second reading. 703.5 – Finance Committee, waive second reading. 403.6/E/R – Substance-Free Workplace, mark reviewed. 404.1/R – Employee Appearance, mark reviewed.